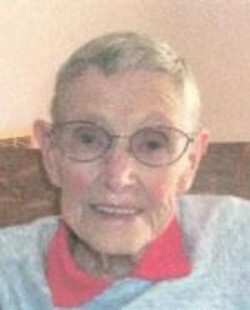 Helen M. Riches, 88, of Bellevue, died Tuesday, January 4, 2011 at Mill Valley Care Center in Bellevue. Military graveside services were held Friday, January 7 at 11:00 a.m. at Wyoming Cemetery, with military rites accorded by the American Legion Post #273. Visitation for Helen was held from 4:00–7:00 p.m. Thursday evening at Hachmann Funeral Home & Cremation Service in Bellevue. Helen was born October 27, 1922 at the Alden home farm in Jones County Iowa, the daughter of Robert and Alice (Fuhrmeister) Alden. She married Frank Riches on March 11, 1947 in Wyoming, Iowa. He preceded her in death on May 29, 1983. She graduated from Wyoming High School and Chillicothe Business College. In May of 1943 she enlisted in the United States Navy Reserve, she was a part of the WAVES (Women Accepted For Volunteer Emergency Service). She was honorably discharged in February of 1946. After her discharge from the Navy she kept books for her father's business in Wyoming until her marriage. She and Frank farmed in the Wyoming area until they retired and moved to Bellevue in March of 1974. She was a member of the First Presbyterian Church and the American Legion Post #273, both in Bellevue. After Frank's death she became involved in volunteer work. Those left to honor her memory include her son, Robert, of Oskaloosa; daughter, Anna Marie (John) Gallagher, of Amery, Wisconsin; three grandchildren, Matthew Gallagher, Jessica Morrison and Jennifer Baker; six great grandchildren; and a sister, Mary Jane Kyarsgaard of Wyoming.